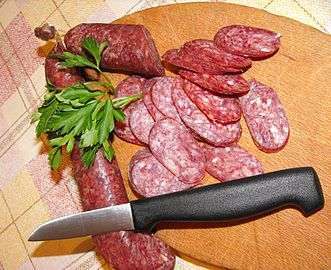 Sujuk is a dry, spicy sausage which is eaten from the Balkans to the Middle East and Central Asia. The Turkish name sucuk has been adopted unmodified in the languages of the region including Bulgarian: суджук, sudzhuk; Russian: суджук, sudzhuk; German: sudschuk; Albanian: suxhuk; Romanian: sugiuc; Serbian/Croatian/Bosnian sudžuk /cyџyk; Macedonian: суџук, sudžuk; Armenian: սուջուխ, suǰux; Arabic: سجق, sujuq‎‎; Greek: σουτζούκι, soutzouki. Cognate names are present in many Turkic languages: Kyrgyz: чучук, chuchuk; Kazakh: шұжық, shujyq. 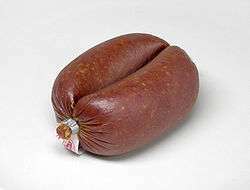 Sujuk consists of ground meat (usually beef, but pork or lamb are used in some recipes and horse meat in Kazakhstan and Kyrgyzstan), with various spices including fenugreek, cumin, sumac, garlic, salt, and red pepper, fed into a sausage casing and allowed to dry for several weeks. 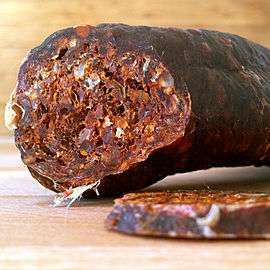 It can be more or less spicy; it is fairly salty and has a high fat content. The confection called sucuk, cevizli sucuk, soutzoukos or churchkhela has a similar shape, but is made of grape must and walnuts. Soutzoukakia, spicy meatballs in sauce whose name means literally "little sujuk"
↑ Using horse parts that are cheaper than those used for the Central Asian kazy, which is made the same way as sujuk, but is more expensive.